Decisions, decisions, decisions. These postings have not been occurring in a timely fashion when a new rock concept is showcased so we will be posting on a monthly, rather than on a weekly basis (perhaps not that few and far between). 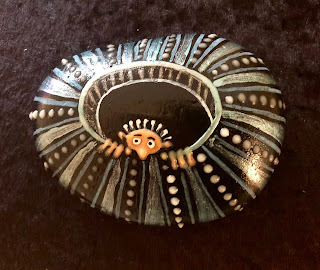 Lately, our interest in rock painting has waned a bit, and the idea of moving in a different direction is starting to come forward. This blog, however, will continue to showcase the unique, one-of-a-kind Spirit rocks as they are produced. Yet, Something having to do with two-dimensional pieces, using other materials besides rocks as canvases. The medium we use will probably be similar, but that may take a turn as well. Other natural materials have produced interesting discoveries. Block wood, bark, cork and glass are entering the picture. Materials that have not been explored up to this point. As this creative pursuit emerges, the postings will reflect the progress. Stay tuned! The rock below is something that has been tried in the past, to show how well 3-D effects look on flat rock surfaces. The creature peeking his head over the top is a take-off on "Kilroy", a character that became popular during WWII. This rock is called "The Invisible heart" which is meant to symbolize how we tend to hold back our love to those we would otherwise give it freely. 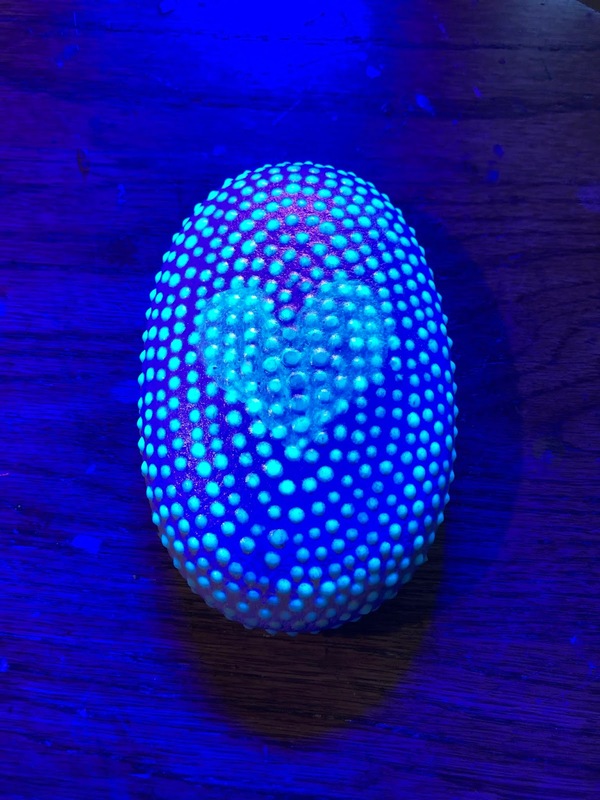 The color here seems rather melancholy, but it is only temporary because it's blue color is how it appears under a blacklight. The dots reveal a teal color which symbolizes serenity, wisdom and patience. 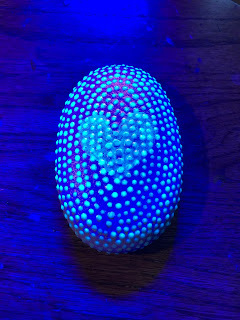 Under normal light, you cannot see the heart. 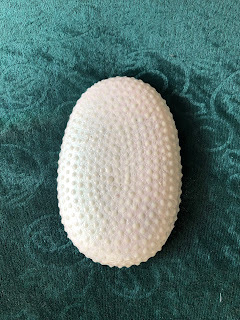 It just looks like a white rock with a lot of white dots that give it texture. The white of course, is a sign of purity which is where each heart began it's journey.This rock marks the beginning of a new adventure in my craft and spiritual journey. Our creative force continues to move beyond form. May your Spirit continued to be Rocked in 2019 and beyond!